The gallery opened in 1988 and during an exciting 23 years 245 exhibitions have been organised by the owner Mrs. Anita Besson (1934). Each year 10 exhibitions were organised (see below). The gallery closed in Juni 2011. 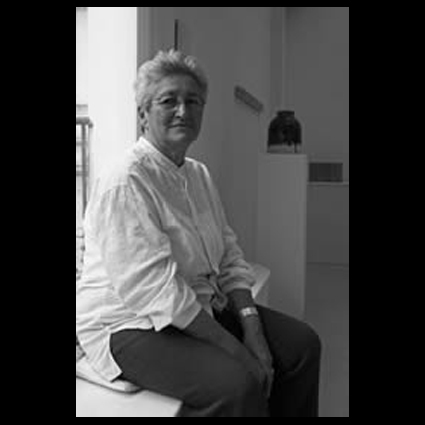 Anita Besson: "It has been my intention that my gallery should be useful in promoting ceramics on the international market. I feel that that has been achieved". Galerie Besson existed in London's West End. The gallery mounted over 200 exhibitions in its 23 year history, 118 of which are illustrated on the pages below. 2011 Claudi Casanovas - Gallery Besson Final Exhibition Gallery Pots Jacqueline Lerat Gertrud Vasegaard Potters from Seven Countries 2010 Elizabeth Raeburn Ken Mihara & Shihoko Fukumoto Ryoji Koie Summer Exhibition Gwyn Hanssen Pigott Lucie Rie Three Danish Potters Contemporary Ceramics Joslyn Tilson 2009 Hans Vangsø Claudi Casanovas Ceramics from Finland Summer Exhibition Shozo Michikawa Peter Collingwood - Hans Coper Pots for Light Howard Smith Classic & Contemporary Ceramics 2008 Priscilla Mouritzen, Riitta Talonpoika & Annie Turner Claudi Casanovas Twenty Years - Twenty Pots Hans Coper - Lucie Rie Betty Woodman Jennifer Lee Yasuhisa Kohyama Neil Brownsword Classic & Contemporary Ceramics 2007 Ewen Henderson - Graham Sutherland Karen Karnes Shozo Michikawa Summer Exhibition Jacqueline Lerat Roe Kyung Jo The Jug Show Classic & Contemporary Ceramics Joslyn Tilson 2006 Gordon Crosby Lucie Rie - Hans Coper Japanese Crafts Summer Exhibition Claudi Casanovas SOFA New York David Garland Three Potters Ian Godfrey Classic & Contemporary Ceramics 2005 Inger Rokkjaer Bodil Manz Prue Venables Summer Show Camberwell in the 1970's Claudi Casanovas Tatsuzo Shimaoka Lucie Rie Functional Form Now Contemporary Potters 2004Landscape in Painting & Ceramics Sebastian Blackie Bernard Dejonghe Summer Exhibtion Shozo Michikawa Gwyn Hanssen Pigott Annie Turner Hans Vangsø Contemporary Potters Japanese Ceramics 2003 John Maltby Jennifer Lee Claudi Casanovas Summer Exhibition Alev Ebüzziya Siesbye Yoon Kwang-Cho Vladimir Tsivin Constructed Clay Gallery Pots 2002 Fernando Casasempere Hans Coper / Peter Collingwood Summer Show Anthony Caro Enric Mestre Lucie Rie Centenary Exhibition Gallery Pots 2001 Casasempere / O'Rorke Claudi Casanovas Gustavo Pérez John Maltby Inger Rokkjaer Tatsuzo Shimaoka Elizabeth Raeburn Daniel Fisher 2000 Katerina Evangelidou Jennifer Lee Sebastian Blackie Summer Show Fernando Casasempere Gwyn Hanssen Pigott Elizabeth Fritsch Claudi Casanovas Anne Fløche 1999 Commemorative Mugs for the Millennium 20th Century Ceramics Hans Vangsø Dame Lucie Rie Vladimir Tsivin Lis Ehrenreich Domestic Ware 1998Christmas Exhibition Dec Bodil Manz Oct - Nov Ryoji Koie: New Work in Porcelain Sep – Oct Summer Exhibition: Three Potters July – Aug Bernard Dejonghe: Ceramics and Glass May – Jun Claudi Casanovas: Tenth Anniversary Exhibition Mar – May Gallery Pots Jan – Feb 1997 Jim Malone Nov – Dec Jennifer Lee Oct – Nov David Leach & Jessamine Kendall Sep – Oct Edmund de Waal Jul – Aug Alev Siesbye Jun – Jul Sara Radstone Apr – May Hans Coper Mar – Apr Lucie Rie Feb – Mar 1996 John Maltby: Kings, Queens and Angels Nov – Dec Claudi Casanovas: Teabowls Oct – Nov Pictures and Pots Sep – Oct Summer Exhibition Jul – Sep Paul Soldner Jun – Jul African Tribal Art May Gordon Baldwin Mar – Apr Gallery Pots I & II Jan – Mar 1995 Elizabeth Raeburn: Tiles and Pots Nov – Dec Danish Pots and their Influence: Group Show Oct – Nov Lucie Rie: A tribute from her friends Sep – Oct Summer Exhibition Aug Gutte Eriksen Jun – Jul Jennifer Lee May – Jun David Leach Mar – Apr Margaret O’Rorke: Light Sculptures Mar Gallery Pots Jan – Feb 1994 Lucie Rie and Hans Coper Nov – Dec Colin Pearson Oct Ulla Hansen Sep Summer Exhibition Jul – Sep Shiro Tsujimura May – Jul Jim Malone Apr – May Ewen Henderson Mar – Apr The Tea and Coffee Exhibition Feb – Mar 1993Christmas Exhibition Dec – Jan Claudi Casanovas Oct – Nov Sebastian Blackie Sept – Oct Summer Exhibition Aug – Sep Lucie Rie and Hans Coper Jun – Jul Pompeo Pianezzola Apr – Jun Ian Godfrey: 1942-1992 – A Celebration Mar – Apr 2 Danish Potters Jan – Feb 1992 Christmas Exhibition Dec – Jan Ewen Henderson Nov – Dec Jennifer Lee Oct Gwyn Hanssen Pigott: Still Lives Sep – Oct Summer Exhibition Aug Elizabeth Raeburn Jul Alev Siesbye May – Jun Lucie Rie: 90th Birthday Exhibition – Part II Apr – May Lucie Rie: 90th Birthday Exhibition – Part I Mar – Apr Mo Jupp Jan – Feb 1991Christmas Exhibition Dec – Jan Ryoji Koie Oct – Nov Tatsuzo Shimaoka Sep – Oct Summer Exhibition Aug – Sep Claudi Casanovas Jun – Jul Elspeth Owen May John Maltby Mar – Apr Selection from a Private Collection Feb – Mar Gallery Pots Jan 1990 Domestic Ware by Artist Potters Nov – Dec Vladimr Tsivin: First London Exhibition Oct – Nov Ewen Henderson Sep – Oct Summer Exhibition Aug Lucie Rie Jun – Jul Jennifer Lee May – Jun Geoffrey Whiting Retrospective April Gutte Eriksen Mar – Apr Prehistoric, Anglo-Saxon & Medieval Pots Feb – Mar 1989 Claudi Casanovas Nov – Dec Elizabeth Fritsch Oct – Nov Ian Godfrey Sep Summer Exhibition Jul – Aug Lucie Rie: White Pots May – Jul Elizabeth Raeburn Apr – May 8 Danish Potters Feb – Mar 1988 Christmas Exhibition Nov – Dec Hans Coper Oct – Nov Ewen Henderson Sep – Oct Summer Exhibition Jul – Sep Claudi Casanovas: First London Exhibition Jun – Jul Opening Exhibition: Lucie Rie Apr – Jun. Portret Anita Besson - Photo M. Lunardelli, with our best regards and thanks. CCC.